I was recently going to get a manicure and I automatically thought to myself, “fall is approaching I have to get a dark color”. For the first time, I thought about why my mind went to dark colors for cold weather and why I had light colors all summer. This corresponds to my clothing as well. I have a black winter coat, black boots, black leggings, grey sweatshirts, but in the summer, I wear all sorts of bright colored clothes. It could have a lot to do with thermodynamics, but in my opinion, it’s because I wear what reflects my mood. I hate winter. If I were to list the most terrible things in the world, winter weather would definitely be up there. I never question my decision to attend Penn State until October rolls around and I spend the next few months in frozen agony. Walking to class becomes a chore and so does pretty much everything else. Skiing is fun, but not nearly as fun as the sunshine! This topic reminded me of the pop quiz we had in class that related depression to TV light. SAD is caused by several things. One of them being the change in your circadian rhythm. The reduced level of sunlight in fall and winter could possibly disrupt your internal clock, causing problems for you and your body. Another reason is that your serotonin levels can drop. Serotonin is a brain chemical that affects your mood so when the sun starts setting earlier, you can become depressed due to lack of serotonin. Another chemical can also be affected: melatonin. This chemical helps make your sleep patterns and mood so it makes sense that if this drops, so does the way you feel. If you find yourself feeling down when fall and winter arrive, check out this article about ways to cope with SAD. There are a few treatments that can help improve your mood and motivation levels if you experience SAD, light therapy being one of them. This therapy mimics outdoor light and in return, can change levels of brain chemicals linked to your mood. Between 50% and 80% of light therapy users become symptom free (source)! If light therapy does not work, and SAD really starts to affect your daily life, further action can be taken after speaking to your doctor. You can be prescribed antidepressants that increase the serotonin in your blood, which in return, makes you happier! For those not wanting to take these steps, there are a few ways proven to help at home. You can make your home environment sunnier and brighter. Something as simple as opening the blinds can help affect your mood! It is also important to spend time outside. Even on cold and cloudy days, outdoor light can help how you are feeling. Exercise is another way because it is proven to relieve stress and anxiety which can increase SAD symptoms. Unfortunately, there is no known prevention to be taken to avoid SAD. It is recommended that you get ahead of it, meaning; if you know you experience some of the symptoms of SAD, start treatment early. As for me, I am already counting down the days until Spring Break in Florida! This entry was posted in Uncategorized on September 6, 2016 by Abigail Reese. I myself have experienced SAD at one point in my life and it is awful. Since I have been at Penn State, I have not experienced seasonal depression. However, when I was in High School, we would get to school early and then have basketball right after school and by the time I left school each day, the sun was down. This continued for most of winter for me and it made me depressed because I rarely saw the sun and when I did it was briefly or through a window. At Penn State, I have the ability to walk around outside in between classes and when I walk from place to place, so I never really get seasonal depression while I am here. But the attitude people have towards season has a drastic change on mood. I love fall; it’s my absolute favorite season. I love the smell of fall, the colors outside, and it really just makes me feel warm and fuzzy on the inside even though the temperature is cooling down. But as winter approaches and it gets really cold outside, it makes sense why we all want to be bundled up in our room sleeping. I really think the best thing you can do to battle seasonal depression is to take some time and get outside. Even if you don’t love winter, get out there and have a snowball fight or build a snowman. Appreciating the little things that each season offers is definitely a moral boost. I find this article very interesting because my friend’s dad swears by this seasonal affective disorder, but he never took the time to actually do any research on it. He always just insisted that people became depressed in the winter months due to the lack of sunlight, and after reading this post, he’s actually right! I can’t wait to tell him about this! He claims that this depression comes from a lack of vitamin D , so he actually makes his family take a vitamin D supplement during the winter months to make sure everyone stays happy and healthy! When I first heard this, I have to admit I thought he was a little insane, but now after reading this and doing a little bit of research on my own, I think he might have been on to something! According to WebMD , there might be a link between vitamin D deficiency and depression, which could be why people get seasonally depressed! A little sunshine or vitamin supplement might be able to cure this seasonal depression!! 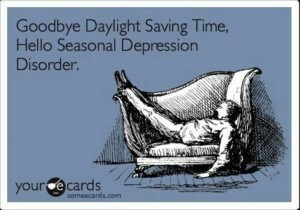 I feel that most people experience seasonal depression. Unlike you I enjoy the change of season. I prefer the cold and the transition into darker colors. Unlike most people during the summer time I am more depressed than in the colder moths. I am guessing this is due to me not like showing skin and using dark colors as an illusion. I liked how you referenced our pop quiz and the mice reaction to the light, great comparison. Wow this blog makes a lot of sense to me. I feel as though I can truly relate to this post. I do not consider myself a depressed person, however I honestly feel less happy during the winter months. Maybe it’s simply because my fingers turn into ice pops after about 15 seconds of cold weather, I’m not sure. The only thing that I am not looking foreward to at Penn State is the winter months. I’m really glad that you blogged about this topic, as i’m not sure if I would have thought to look it up myself. I definitely believe that SAD is a real disorder and I hope that anyone who has this disorder can manage it with some of the treatments you discussed. Being someone who loves winter and snowboarding , I found your post to be very interesting. I do believe SAD to be something that is very real that I have seen in other people, but ever in myself. This makes me wonder if it is caused more by changes in persons habits. You discussed that one of the causes could be less sunlight, causing and individuals circadian rhythm to be disrupted. Is this because the sun is actually out for less time, or that people spend more time away from the sun? You mentioned that the best way to deal with it is to get ahead with treatment, but what about taking a better approach to the cold months. Being optimistic ahead of time, finding things to enjoy and ways to spend your time, I feel, could also help to curve SAD. There are not many things most people have to look forward to in late fall and cold winter, but finding things you enjoy during this tie may have a change. This is honestly just a thought I had while sitting here and has no evidence behind it. Great post and good research put into it! It’s truly interesting how the human mind reacts to the changing of the seasons. The question I have is, what about those who enjoy winter the most, over the other holidays? My father’s favorite time of year is winter, and he enjoys the cold. Is there something different in his brain that he enjoys the lack of sunlight, when so many others get depressed that time of year? I’m truly the opposite, getting heavy ‘spring fever’ near the end of winter, wanting nothing more than warm weather and to be outside. I usually don’t trust Web MD for symptoms, but here’s a list of symptoms listed for SAD. I thought it was a clever comparison you made between seasonal depression and choosing a color at the nail salon, because I had never thought of it that light before. Winter and Fall are truly associated with darker colors, and sometimes that is not our choice but most of the time it is. We could just as easily wear the same colors we wear in the Spring and Summer but something in our minds seem to switch off and attract to more depressing colors. I experience seasonal depression sometimes, so I thought it was helpful that you mentioned a treatment like light therapy. When I clicked on the link you provided, I thought it was interesting seeing the price ranges that people will pay just to avoid seasonal depression.